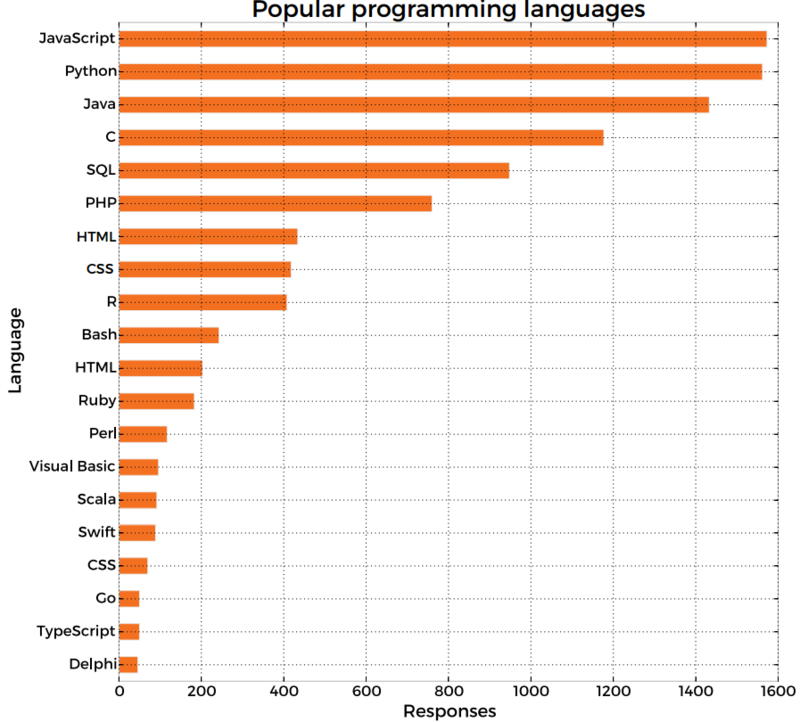 The Python programming language makes a surprisingly strong showing in a new skills survey of more than 11,500 developers and IT pros conducted by Packt Publishing Ltd.
"If there's one language that's defined 2015 and 2016, it's Python," said the new Skill Up 2016 report (free download upon providing registration info), based on aggregated results of this year's survey and last year's. 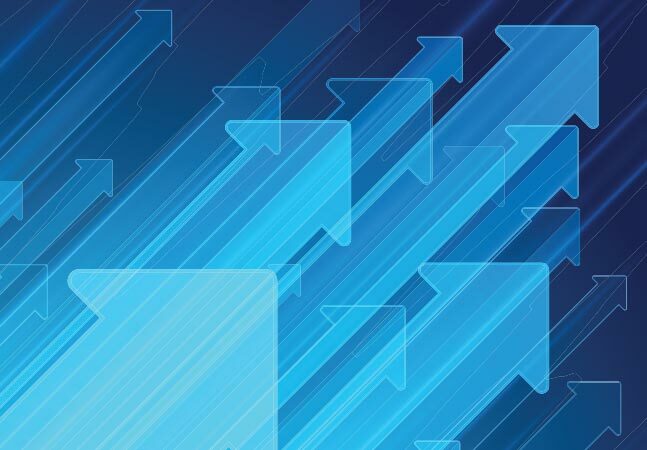 Boosted by its facility for crunching Big Data numbers and other data science tasks, Python fared well in multiple rankings in the survey, which polled developers and IT pros around the world -- with an especially strong U.S. presence -- in order to capture "a snapshot of the modern tech community, to discover the tools and techniques developers are using to succeed in 2016." "Python is still gaining ground on many, many fronts -- as a data analysis tool, as a general purpose programming language, and even a tool to facilitate Web development," the report said. "So, what sort of developers are choosing to work with Python? 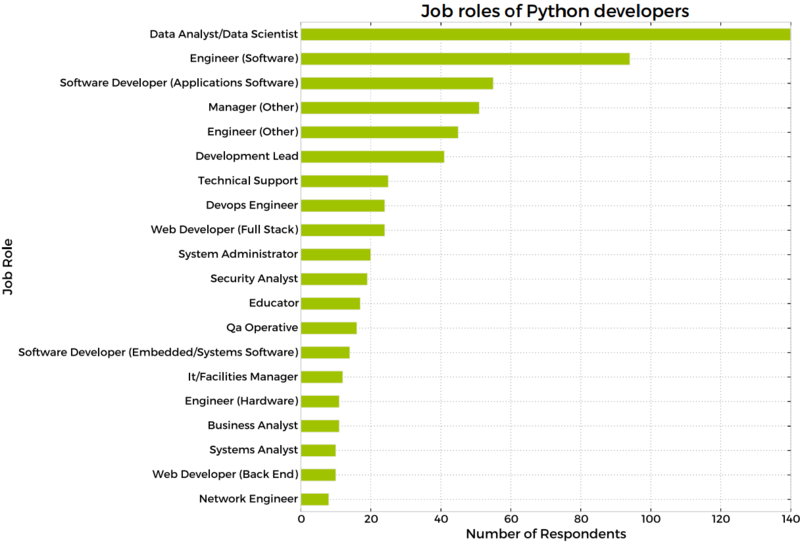 According to our data, it looks like a very diverse range of developers are using Python -- almost all of them! Python really is a tool for all trades, which explains why it's so ubiquitous as respondents' 'most useful tool.'" 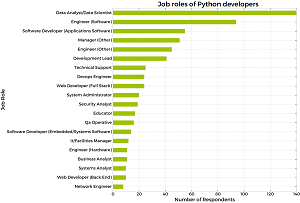 The top three job roles of Python developers are data analyst/data scientist, engineer (software) and software developer (applications software). Most developers using Python are classified as "individual contributors," followed by development lead and freelancer/consultant contractor. 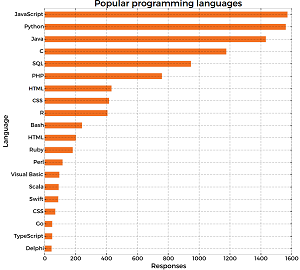 Other survey results indicate Python is most popular among developers aged 30-44 and among "large" companies. According to the Python.org Web site, "Python is a clear and powerful object-oriented programming language, comparable to Perl, Ruby, Scheme or Java." Runs anywhere, including Mac OS X, Windows, Linux and Unix. The language also has fared well in other reports, such as one about the top-requested freelance skills (ranking No. 5), one about "most adored" languages (No. 4), and the latest TIOBE popularity index (No. 4). Python also figured prominently in a Packt report of the top money-making skills in data science and business intelligence published a year ago. 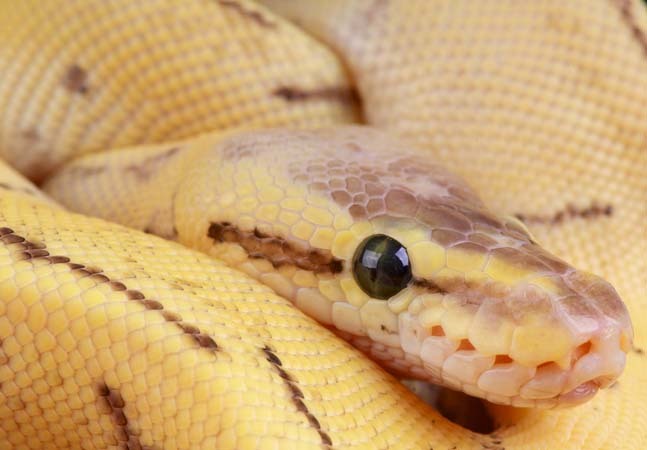 "Python is definitely top dog when it comes to data," Packt said in last year's report. 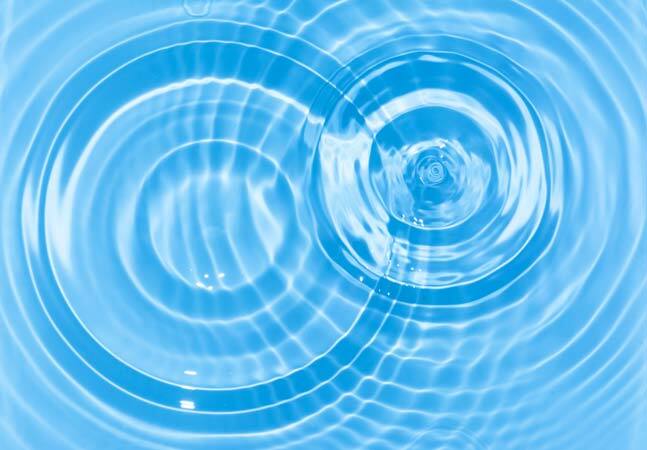 "Its versatility and wealth of easy-to-use third-party libraries for everything from machine learning to Web scraping, combined with its low barrier to entry, make it the ideal choice." 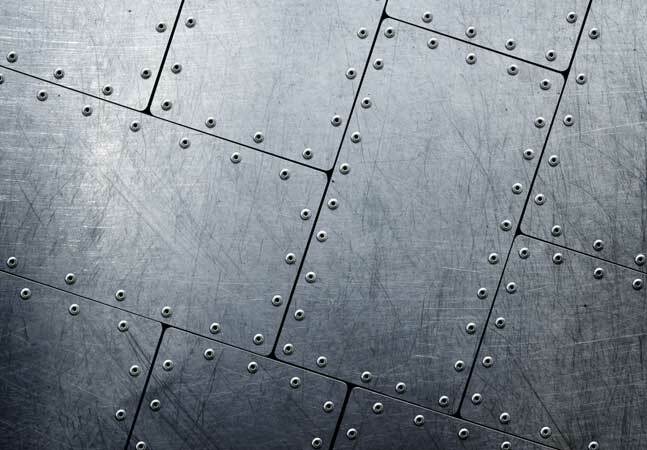 It's also popping up in other places, as data analytics company Cloudera Inc. last year launched a new tool to provide an end-to-end Python stack for Big Data analytics, and just last week Amazon Web Services Inc. (AWS) added a new preview offering: the Python Serverless Microframework for AWS. All in all, the new Packt report just published today summarizes: "If you want to develop in 2016, you increasingly need to know Python." Packt, a U.K.-based company that provides learning and information services for developers and IT pros, also launched Mapt, an online learning platform for developers, in conjunction with publishing the survey.